Now that the knees are about fixed, the plans are being laid for some serious RVing this year, beginning with a couple of local trips. We belong to the Tennessee Travelers Chapter of FMCA as well as the Thor Diesel Club and will attend rallies held by them this spring. For these trips, we will spend time in Pine Mountain, GA (Callaway Gardens), Stone Mountain, GA, and the Tennessee Smoky Mountains. After another local trip or two, we plan to spend part of the summer where it is cooler and after debating between Michigan, New England, and the West, we opted for the Colorado high country and keeping with our plans to make the longer drives while we are more able (younger). For this trip, after a weekend in Kansas City, we will make stops in the warmer parts of Colorado in Denver at Chattfield State Park and another visit to Grand Junction before heading to the Centennial RV Park in Montrose, Mesa Campground in Gunnison, and Snowy Peaks RV Park in Buena Vista. After Colorado, we will head south for a little time at Santa Fe Skies RV Park in Santa Fe, NM before heading home. I am really looking forward to these trips and being able to do some of the light hiking I’ve been unable to do the past several years. If you are familiar with these campgrounds or have suggestions for places to see and things to do in these areas, I would appreciate the info. Once again, we will plan to meet up with some blogger buddies along the way and as always, we hope you will join us in our travels via the blogoshere. 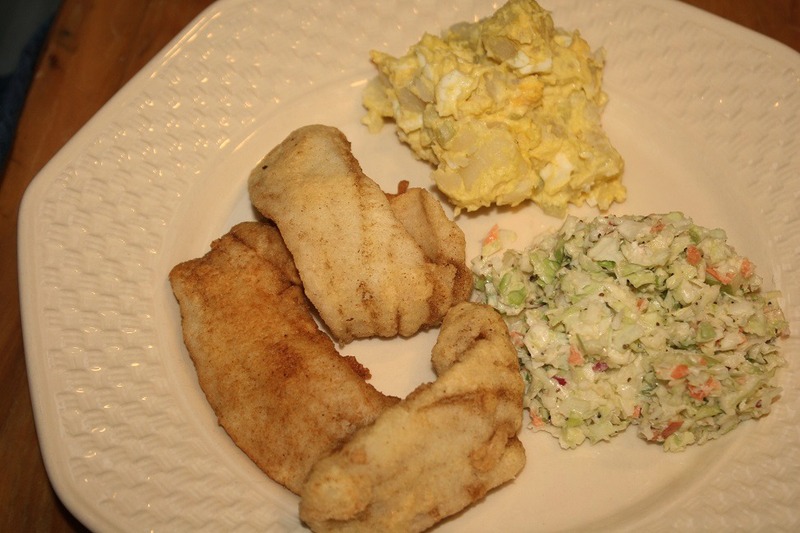 We were in the mood for some fried crappie and decided to do a little taste test while we were at it. Over the years we have used a variety of fish breadings and batters, both store bought and homemade and recently have picked up a couple of new ones. While at SeeWee’s Restaurant near Mt. Pleasant, SC a year or so ago, we decided we really liked their fish breading and discovered it was House Autry Seafood Breading and it is available in our grocery stores. Then we noticed that one of my blogger buddies regularly uses McCormick Fish Crisp which I have only been able to buy from Amazon. For tonight’s meal, we decided to give them each a try by deep frying in 350* oil. 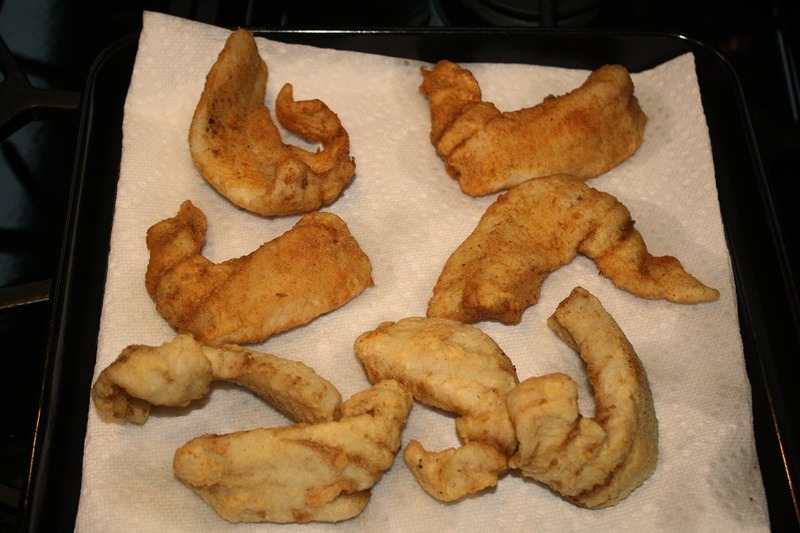 The slightly moist fish pieces were breaded with each mix then fried in separate batches with the first one kept warm while the second one cooked. I added no salt or other seasoning until after we tasted them – each needed more salt for my taste. Here they are after frying and plated along with some slaw and potato salad. As can be seen, the House Autry (in the back) is darker in color even though they were cooked for the same time and the oil temps were the same - I was surprised at the difference here. While the tastes were similar, we all thought the House Autry had just a little more flavor. Next up we’ll use them to pan fry a batch and see how they compare that way, but for now, we’ll lean toward the more readily available House Autry. If you have a favorite seafood breading or batter, I'd like to hear about it. After four days in the hospital and seven days at a live-in re-hab center, I'm writing this from the comfort of my easy chair and looking forward to sleeping in my own bed tonight. Other than the usual pain, I believe I'm doing well and further along than the first time where I did not go to the re-hab location. Unless something unexpected happens, it's now just a matter of completing the re-hab regimen which should be about a month. Thanks for all of the good wishes, no more updates planned and regular blogging will resume when I have something to write about.